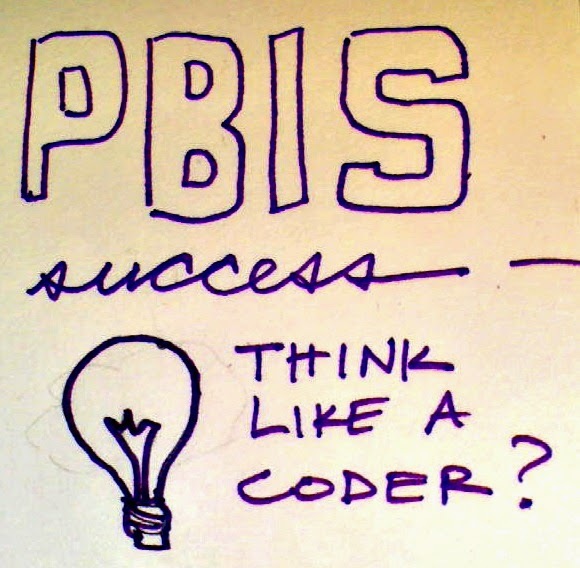 evangelizing the (digital) natives : PBIS Success: Think Like a Coder? If I were to describe to any of my non-educator friends what PBIS is about, I'd say its a system to structure proactive strategies for setting a positive climate for the classroom/school. You teach the good behaviors, get 80% of the kids on board with that, and then you commit more time resources to the other 20%. Activity sequencing increases student engagement by providing the student with “brain breaks.” These strategies can help students to build endurance for more complex or rigorous tasks. In addition, sequencing easier tasks before more rigorous activities can help build “behavioral momentum .” Behavioral momentum increases the likelihood that students will complete challenging tasks. Providing students with activity choice can also increase engagement by giving students control over when to do more difficult tasks. When I read that, I think a lot about the supports my son's early childhood special ed teacher provides - she talks with him and his classmates a lot about their schedule, and "if you ______, then you can ______." Its very helpful for him with transitions from preferred to non-preferred tasks. Is designing a PBIS system for your classroom or school anything more than identifying the outcomes you want (a button takes you to a link in coding, a student independently takes care of materials in the classroom), and then laying out the instructions to get you there? When your procedures don't produce the outcome you want (broken link/students off task) you seek out the bug, isolate the problem and fix the instructions to generate the appropriate outcome! I read in a blog around the same time that most software engineers love strategy games because they enjoy thinking out several plays ahead, anticipating other players' moves and responses to their own actions - I think the same would go for many teachers. If you're not one step ahead of your students in the classroom, you and your students will definitely end up feeling chaotic and disorganized. Don't the most well-run classrooms all share the same characteristics of order, routine, and procedure? I'm hesitant to follow the analogy all the way out to expecting yourself or your students to always behave predictably (darn the human factor), but from my current understanding, one goal of PBIS is to increase consistency of expectation (and resulting behavior responses), and from my knowledge of coding or software design, the best apps or websites are the ones that give a user-experience that is thoughtful, predictable and reliable.